Our existence on this earth is no accident, coincidence, or freak of nature; our work, purpose and mission parameter is of more importance and of far greater significance than to simply survive this physical plane for 80 years ~ for the sake of competing with our neighbors ~ just to see who can accumulate the most money, the greatest power, and the most toys.... Our species was designed, created, engineered, by a supernatural cosmic energy field of pure spiritual love-consciousness, and with far greater hyperintelligence than our own.... But most human beings do not even care if they may be missing out on 95% of the existential spectral bandwidth, and higher alternative etherealities go undetected.... They consummate their sojourn through this physical dimension having never witnessed or experienced ~ having never been aware of or invited into ~ never integrating, assimilating, synchronizing or interfacing with the primordial, hyperdimensional, superconscious intercollective spiritual family. ​Existence, reality, our environment, as perceived through the filtering, distortive lens of mind – in a shallow, incomplete, subcelestial context – is a fiction, a fairy-tale, a partial quasi-reality.... 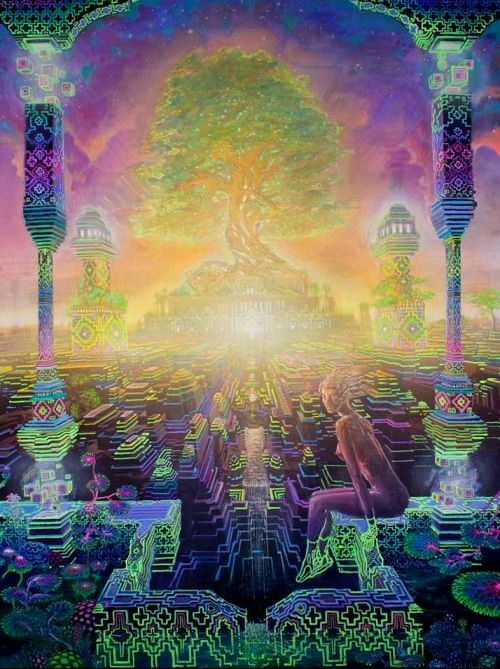 But through entheogenic spiritual technologies and altered perception – through yoga, meditation, and the awakening of our chakras – we see the full spectrum of multidimensional reality through the broader lens of universal spiritual consciousness .... and the attraction of the physical dimension is no longer exaggerated. In The Absence of The Psychedelic Ontological Experience We Become Enslaved By The Ego And Its Fear of Disappearing Into The Unfathomable Enigma of Subatomic Etherealities, Universal Consciousness, And The Mysterious Matrix of Feeling That Is All Around Us; We Become Lost In A Desert of Dry Intellectual Knowledge And Peripheral Hypothetical Ideologies. Living Within The Confines of The Ego is to Live in a State of Unconsciousness: One is oblivious to all supernatural phenomena, subatomic hyperphysical realities, and transcendental planes – unaware of 90% of the multidimensional existential bandwidth. To live in a state of unconsciousness not only narrows and diminishes one's experience of the sublime hyperdimensional mystical environment we exist in but creates a limited, incomplete misperception of existence... our vision – our awareness – our perception – is restricted to the physical, three-dimensional plane. 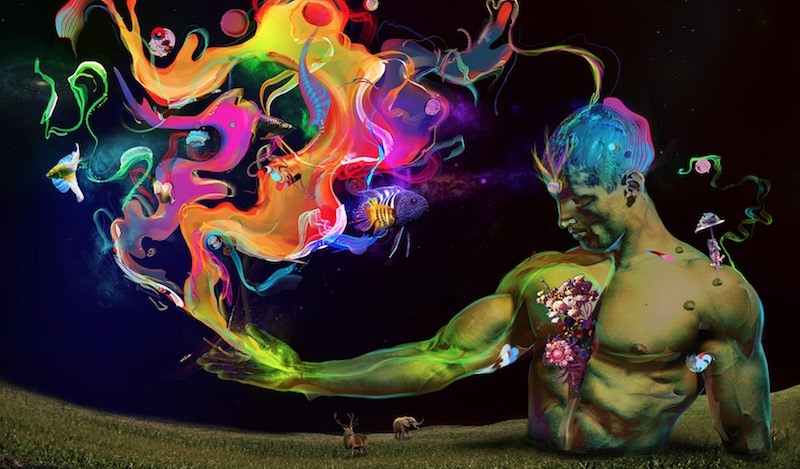 A Side-Effect of Living In The Ego is that we are cut off from the living supernatural streams of primordial spiritual energy which flows through the innermost cosmic depths of our being while in transcendent states of universal spiritual superconsciousness. We are transforming the narrow vision of "microscopic mind" into the panoramic vision of universal-consciousness. Those able to separate themselves from the superficial, the ephemeral, the fictitious – surrender to higher spiritual realities, higher spiritual beings, a higher spiritual Way – will enter higher harmonics and greater spiritual realities. You will now witness, experience, and integrate into the Supreme Reality – the primordial metaphysical superspace – which you had long suspected to exist, but were never able to confirm. ​Through Transcendental Meditation and Entheological Spiritual Technologies, that open doors of perception into alternative hyperphysical realities, the narrowly focused lens of mind is dilated, expanded, transformed.... Through the much broader lens of Universal Spiritual Consciousness we shall be transmuted into the Primordial Superconsciousness of the Cosmos. 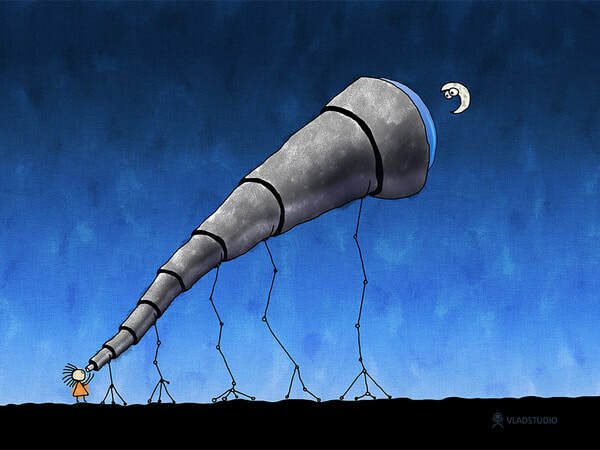 We will look through the telescope of transcendent universal awareness into the mystical, the supernatural, the hyperdimensional, the otherworldly. Through the telescope of universal cosmic-consciousness we will enter higher celestial planes of existence; we will encounter and intercommune with our interdimensional overseers – Rulers of The Stellar Orders. 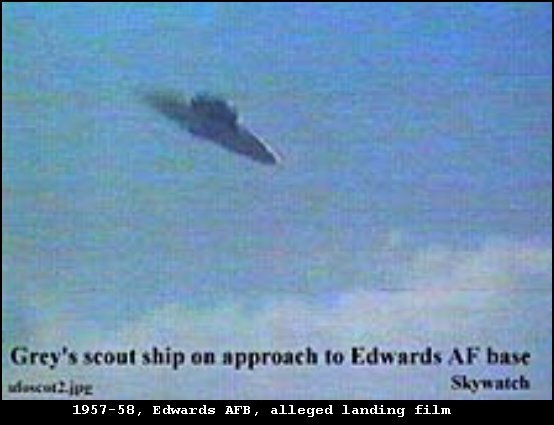 Photo from instruction-film of UFO landing at Edwards AFB. 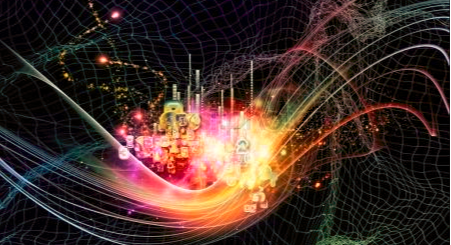 This Three-Dimensional, Molecular, Space/Time Continuum, Which The Human Mind And Perceptual Systems Are Exclusively Attuned To, Intended For, And Compatible With Is Not The Only Channel On The Existential Bandwidth ~ There Is An Infinite Number of Dimensions And Channels, And All That Is Required To Visit Them Is The Proper Boundary-Dissolving Spiritual Technology ~ Designed To Increase Our Harmonic Resonance And Extend Our Perception. Is it Really So Unbelievable, so inconceivable and implausible that human science has not yet fathomed the technologies and instruments that would be capable of detecting and confirming the existence of hyperdimensional etherealities, extraterrestrial hyperspace deiforms, and their "spacecraft," which seem to be operating in our airspace ~ monitoring us, intervening in human affairs, influencing or completely controlling the outcome of important events on earth? Perhaps it's an explanation as to why Bible prophecy has always been extraordinarily accurate ~ because these ethereal interdimensional apotheons have always been with us, behind the scenes, guiding the course of human history. It was only a few years ago that educated people knew absolutely nothing about the existence of radio waves, x- rays ~ subatomic hyperdynamic cosmic forces, fields, and particles ~ so fine, so etheric, as to be virtually undetectable by any instrument of modern science. These ultradimensional, extraterrestrial, superconscious, hyperspace entities are made of this exotic subatomic substance: "the ultimate constituent," "the universal constant," "ether," "the primordial quintessential singularity," "dark-matter" ~ nobody really knows what to call it. They exist at higher harmonics ~ at a place on the existential bandwidth which has yet to be discovered or penetrated by conventional science.... But just because mainstream science has not yet demonstrated a method to detect or prove their existence does not mean these esoteric dimensions, fields, and lifeforms are nonexistent. It simply means one must discover, develop, experiment with ego-dissolving spiritual technologies that will authenticate, actualize and confirm the existence of these hyperdimensional beings. Three-Dimensional Physical Reality, that we as human beings are familiar with and evidently intended and designed for, occupies but one channel, one tiny section on the existential bandwidth. There are other channels, other dimensions, that are just as real as the one we inhabit, but which our minds and senses are not attuned to. But someday scientists will make a momentous discovery: ALL of the elusive dark-energy and dark-matter, that has been mysteriously missing in action, according to our most prominent, high-profile, modern-day physicists, and actually accounts for 95% of existence, will be discovered to exist in other dimensions ~ in subatomic astral fields and ethereal hyper-realities ~ on some of the other channels on the existential dial... We simply never had the necessary equipment to comprehensively and intelligently explore, experience, and detect these other dimensions ~ these higher planes of existence. 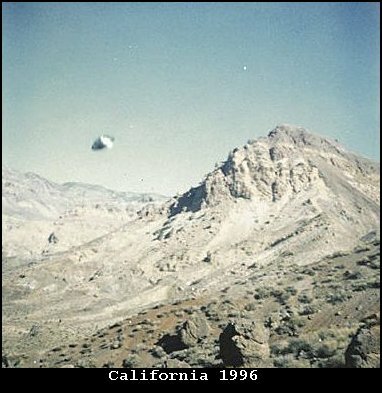 Hundreds of Years Ago, before there were scientists to pronounce such things to be impossible, people witnessed and interacted with spiritual, hyperphysical beings. The people did not have electronic instrumentation, advanced technological knowledge, or scientific resources to search for answers, but relied upon spiritual exploration, altered states of perception, entheogenic preparations, and higher planes of consciousness, to not only elicit and enhance these outré, mystical interactions in ethereal, metaphysical, fifth-dimensional superspace, but to gain access to the full-spectrum, multidimensional, electromagnetic bandwidth of existence. The phenomena of ultra-advanced, interdimensional, supernatural, hyperspace entities entering our atmosphere, our dimension, our plane of existence seems to be as old as the human race itself. We simply never had the advanced technological equipment to comprehensively, intelligently, scientifically explore these alternative dimensions. Such equipment will never exist, because the equipment needed for this is our own illumined and expanded cosmic-consciousness. The key that unlocks the doors to the greatest mysteries of existence ~ the mystery of UFOs ~ the mystery of ancient godlike beings of light ~ the mystery of hyper-evolved, interdimensional, extraterrestrial hyperintelligence ~ omniscient superconsciousness ~ ALL mysteries, miracles, and phenomena in the Holy Bible are attainable through your own meditative transcendental states of Universal Spiritual Consciousness .... through higher spiritual harmonics and the primordial hyperdimensional unity-field ~ which has always existed within the cosmic depths of your own being .... which, in these modern times, has become a lost art. Only By Penetrating and Exploring The Higher Celestial Planes of Existence —the interdimensional / supernatural / metaphysical / UFO phenomenon ~ the universal transcendental, integrative, hyperspace reality matrix itself ~ could we ever hope to be awakened, transformed, and illuminated to the degree necessary to have encounters, communion, and interrelationships with hyper-evolved extraterrestrial godlike deities ~ with astral hyperdynamics ~ beyond anything conceivable through the dry, intellectual, one-dimensional, circumscriptive processes of the human mind and physical senses. ​We must be willing to experiment with ego-dissolving spiritual technologies designed to help us realize our full spiritual potential ~ the higher Universal Cosmic-Self ~ Christ-Consciousness. We must embrace spiritual technologies that alter perception, expand awareness, and reveal full-spectrum multidimensional Ultimate Truth about existence. 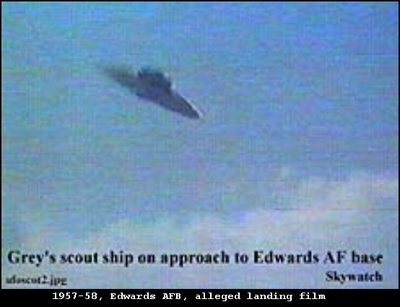 To Those With Limited Understanding, Closed Systems of Belief, And Narrow Minds: Ultra-Advanced Esoteric Alien Technologies Appear To Be Magic...The Hyper-Evolved, Supernatural, Deiforms of Light, With Extraordinary Intelligence Clairsentience and Awesome Inexplicable Powers Appear To Be Gods. Are You Beginning To Understand Why The World Is The Way It Is? Look Around The Earth Now And Tell Us, What Do You See? War, Murder, Famine, Depression, Materialism, Fear, Economic Crisis, Racism, Hate and More War. The Illuminati Know All This And They Are Using This Knowledge Against Us To Keep Us In Low Vibrational Frequencies... And Thus, Make Us More Easily Controllable Slaves. Please, Let's Wake Up!... And Start Loving Each Other Again.